Summer should be filled with easy meals, that are simple yet scrumptious, and these Grilled Shrimp Tacos with Summer Squash, and Fresh Spinach are the perfect go to dinner! I find myself working long hours these days and coming home exhausted, yet still needing to pull dinner together, quick and easy meals during summer that don't heat up the kitchen are a favorite. I try and cook one farmers market based dinner a week. I love to support local growers! For these taco's, I like to use whatever squash I find at the farmers market, today was patty pan squash. (it is the small yellow ones in the shape of child's toy spinning top). and zucchini. I also grabbed some baby spinach and a nice red onion from the farmers market for this one. If you have a nice seafood supplier at your farmer's market, go get your shrimp too! 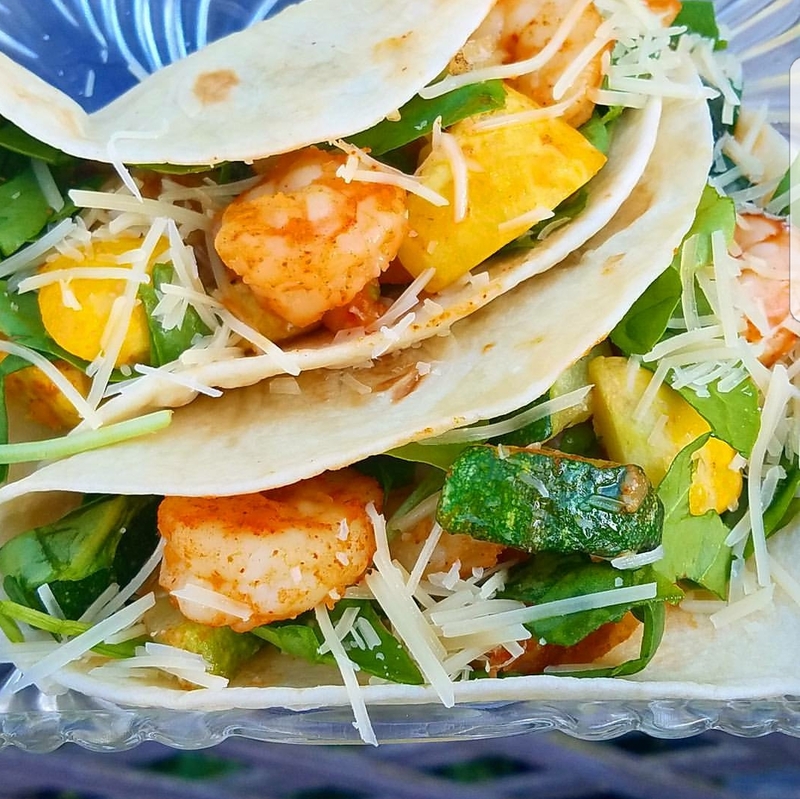 So grab a grill pan, few fresh squash, oh.. and some shrimp, and let's get grilling some tacos! Lightly brush, 2 Tablespoons oil onto grill pan.In mixing bowl, lightly toss zucchini, squash, onions, and garlic powder together. In a separate mixing bowl, mix taco seasoning and shrimp together, set aside. Place shrimp onto grill pan, and cook over medium heat, turning every few minutes, for 5 minutes. Pour Vegetables onto grill pan, and lightlly turn every 1-2 mintues. Cook for 4-5 Minutes, till shrimp is pink and cooked through and vegetables are crisp tender. Remove pan from heat.Divide spinach evenly between tortillas. Divide shrimp, squash mixture evenly between tortillas. Top with Parmesan cheese, and optional toppings. What a great idea for tacos! We tend to be boring with our taco fillings and I really need to switch it up like this more often!